Allows users to create 3D photos from pairs of 2D pictures taken from standard cameras. 3DComposer works on pairs of pictures you take that create left and right eye views of a subject. With a single button press, 3DComposer automatically finds all related picture pairs and makes 3D pictures from them, in either MPO or JPS format. It automatically corrects the alignment of the two pictures so the resulting 3D pictures look their best. 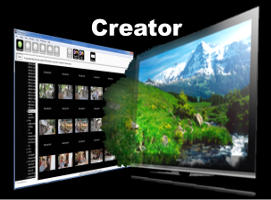 If you like, it can create 3D photos that are automatically sized to fit perfectly on your 3D TV. It's easy to use and easy to get good results. 3DComposer includes a 3D viewer so you can view 3D pictures using your PC. Several different monitor types are supported (see the System Requirements tab). 3D pictures created with 3DComposer can also be viewed on any device that can display 3D images in MPO or JPS format, such as 3D TVs and 3D-capable mobile devices. Once you have great looking 3D pictures, you'll want to share them with family and friends! 3DComposer makes it easy to upload your photos to 3DMedia's online 3D Photo Gallery. The included 3D viewer can play slideshows of the 3D pictures you store in the gallery. With a gallery account, you can create your own public or private albums to organize your pictures. Take a look at our 3D Photo Gallery, then post your own 3D pictures! Join the conversation by adding comments or ratings to pictures. To fully appreciate your 3D pictures, it is highly recommended to view them on a 3D-capable display such as a 3D PC monitor or 3D TV. More information about 3D viewing is below. 3DComposer includes a viewer for displaying 3D pictures on your PC. This viewer supports monitors that can display 3D content presented in one of the following formats. 3D Vision ® - Many 3D PCs use NVIDIA's 3D Vision system, which includes a graphics card, a 120Hz monitor, and active shutter glasses. Several computer monitors, TVs, and projectors are compatible with this system. Side-by-side or Top-bottom - Some displays accept 3D content presented in one of these formats. This is a common choice for 3D TVs. Interlaced - Some monitors display 3D by interlacing the pixel rows of the left and right images. These monitors use passive 3D glasses similar to the ones used in movie theaters. Anaglyph - If you don't have a 3D-capable monitor, you can still view 3D photos on your PC using anaglyph mode. Viewing in this mode requires red/cyan (or red/blue) filtered glasses. Search the web for "anaglyph glasses" to find dealers. You can have a single pair mailed to you for $1 plus an envelope at rainbowsymphony.com. This is a very inexpensive way to discover the world of 3D, but the image quality is not nearly as good as in the other display modes. The 3D photos created by 3DComposer can also be viewed on 3D devices other than PC monitors. The requirements are a 3D-capable electronic display and a 3D photo viewer program to drive it. Several types of 3D display systems are available, and more products with 3D displays are being released on a regular basis. 3D TVs are arriving in the market at a rapid pace, providing an excellent way to view 3D photos on a big screen. The latest Panasonic and LG 3D TV models contain an application for viewing 3D pictures (MPO files) on a supported external storage device such as a USB drive or SD card. These Panasonic TVs are in the Viera ® series, while LG support for 3D photo viewing started with its Infinia ™ series and continues with its most recent models. Even if your 3D TV doesn't include a 3D photo viewer, you can use one on a PC or other external device that can connect to the TV via HDMI. For example, the Panasonic DMP-BDT series of 3D Blu-ray players can play back 3D photos stored on optical media, USB drives, or SD cards. Other TV-connected devices that can display 3D photos are available, and more will surely be coming soon. Note that all DLP-based HDTVs should be 3D ready, and a large number of them are already in homes (mostly made by Mitsubishi and Samsung). These TVs require an external device to send the 3D pictures via HDMI as mentioned above. The Nintendo 3DS ™ gaming system can import MPO format 3D images and display them on its screen for 3D viewing without glasses. Phones such as the HTC EVO ™ 3D and LG Optimus ™ 3D support 3D image viewing without glasses. © 2013 3DMedia. All Rights Reserved.